Interactive payment card developer Dynamics has signed a deal with MasterCard that will see the payments network offering the startup’s technology to its issuers around the world. MasterCard has also participated in Dynamics’ US$70m Series C funding round, along with Canada’s CIBC and existing investors Bain Capital Ventures and Adams Capital Management. When a consumer enters the correct unlock code using the card’s buttons, the payment card number is provided on a built-in display for online use and is written to the ‘stripe’ on the back for in-store use. 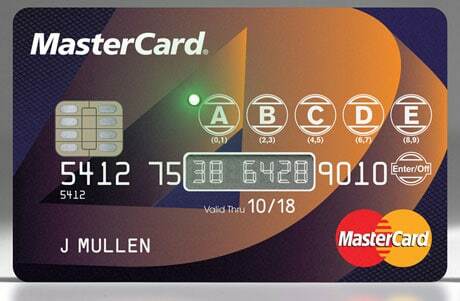 “Consumers can now enjoy additional value whenever they make a purchase simply by pressing a button on their card,” Mullen adds. “Dynamics also pairs their card technology with interactive mobile applications to help move the consumer that much farther into the digital world. The technologies have many practical applications and will allow issuers to offer multiple consumer features and functions in one card. “This includes cards that offer consumers multiple selectable currencies, access to both debit and credit accounts and cards with a co-brand that offer credit or debit in conjunction with a separate loyalty application. “As safety and security in everyday payments is at the heart of MasterCard’s business, its expertise in these areas will also enable the companies to develop new security-oriented products on a global scale while continuing to allow consumers the choice of how they pay,” the startup adds.